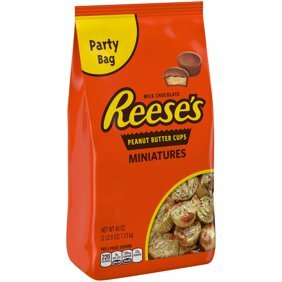 Reese's Peanut Butter Miniatures Assortment Chocolate Candy, 36 Oz. Enjoy your creamy peanut butter in a variety of ways with this REESE'S Miniatures Peanut Butter Cups Assortment. 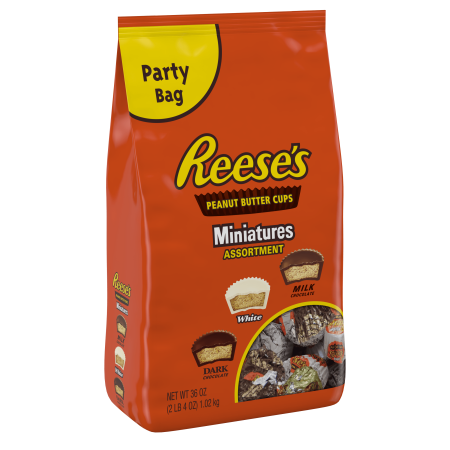 This assortment features three of REESE'S Miniatures most beloved flavors, including REESE'S Peanut Butter Cups, REESE'S Dark Peanut Butter Cups and REESE'S White Peanut Butter Cups. Ingredients: Reese's Miniatures White: Sugar; Peanuts; Vegetable Oil (Cocoa Butter, Palm, Shea, Sunflower And/Or Safflower Oil); Nonfat Milk; Corn Syrup Solids; Dextrose; Milk Fat; Contains 2% Or Less of: Salt; Soy Lecithin; Vanillin, Artificial Flavor; Tocopherols, to Maintain Freshness; Tbhq (Preservative); Pgpr, Emulsifier. Reese's Miniatures: Milk Chocolate (Sugar; Cocoa Butter; Chocolate; Nonfat Milk; Milk Fat; Lactose; Soy Lecithin; Pgpr, Emulsifier); Peanuts; Sugar; Dextrose; Salt; Tbhq (Preservative). Reese's Miniature Dark Chocolate Cup: Semi-Sweet Chocolate (Sugar; Chocolate; Cocoa Butter; Milk Fat; Soy Lecithin; Vanillin, Artificial Flavor; Pgpr, Emulsifier; Milk); Peanuts; Sugar; Dextrose; Salt; Tbhq (Preservative). I will be continuing purchasing the mix bag. Excellent Tasting Candy. The Best Treat You Can Have At Anytime. I like the combination of all three flavors in one bag.